There are hundreds of press opportunities which come out every single day from journalists looking for a source to quote in an article they are currently writing. These opportunities are timely and usually journalists need a good response to their query from an expert within days of submitting it. There is an art to answering a query and getting a response. Today we interviewed one of our customers – Agata from Groove HQ who used an out of the box approach to answer a press opportunity and got featured in press shortly after. Enjoyed the article? I have more, just for you! I'm the founder of JustReachOut.io which helps 5,000+ small businesses and entrepreneurs pitch press and get exposure daily without any help of PR firms. Is it necessary to always use their real email address? 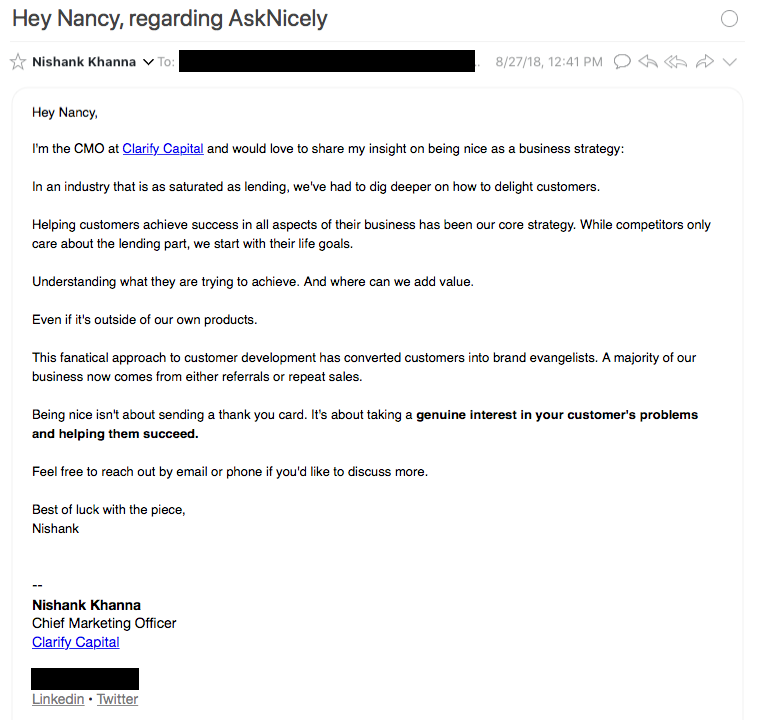 Hey Ajay, using their real email address increases the chances of their response significantly. Keep in mind these journalists receive hundreds of responses, you job is to stand out among all of them. Thanks for the post. Curious, If the deadline has already passed, would you still send the pitch? Sure, if it just passed a few days ago or so I’d still send it but if it has been more then a few days I won’t bother and wait for another opportunity, they come up daily. Love the template example Dmitry, really helpful! No prob Josh, happy to hear you found it useful. Let me know how it works out for you as you get going using the template. Would you answer a #journorequest on Twitter the same way, i.e. snoop on the journo, find out about them a bit, personalize? Seems like a lot of work. Hi Susan, agreed, it is a lot of work. It’s really a question of whether you want to increase your chance of response. For me this approach gets 90% response. Twitter is a bit of a different beast however since you have their profile right there you can look over their past tweets and rather quickly come up with a personalized response, the “snooping” part is rather quick. Wouldn’t you agree? I just came across your site tonight. I was reading an article that was helping navigate HARO. Thank you for your tips! Happy to help Matt. Are you primarily focused on press opportunities for your initial PR outreach/relationship building?